Sunday dinners are something of importance to me. It’s a time to relax, take some effort to cook something special that hopefully lasts a few days into the week and reflect on the past week and the one to come. But with the uncomfortably hot weather, any type of heavy duty cooking in the kitchen has become a sweaty chore. Fortunately, Fleming’s Prime Steakhouse & Wine Bar is offering up a deal with their Sunday Prime Rib Special. Specially priced at $29.99 for a limited time, their prime rib special includes three courses and their freshly baked, complimentary bread. If one can live on bread alone, Fleming’s would be high on my list. 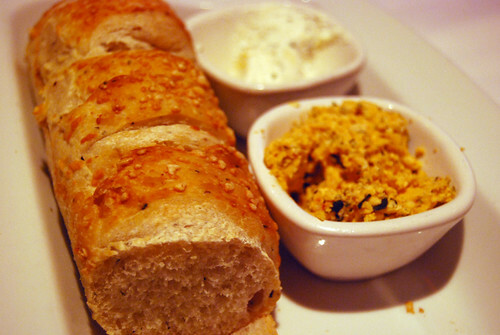 It’s a soft, seeded demi-baguette crusted with a bit a parmesan cheese. It’s fine on its own but elevated to almost meal status when topped with a savory, sun-dried tomato butter or one flavored with chives. You can go a bit crazy with their bread but save room for the three courses that follow. One piece of advice: as you’re munching on bread, take the time to ponder the following selections that accompany the prime rib special. There’s one salad from a choice of three, one side to accompany the prime rib entrée and dessert. Much like a choose-your-own adventure novel, the choices you make can lead to a different taste experience but instead of an untimely death, everyone who participates is stuffed and hopefully satisfied. It’s was practically a no-brainer to go with the housemade Fleming’s salad that won over the wedge and Caesar salad. It was a light and tangy precursor to the prime rib. 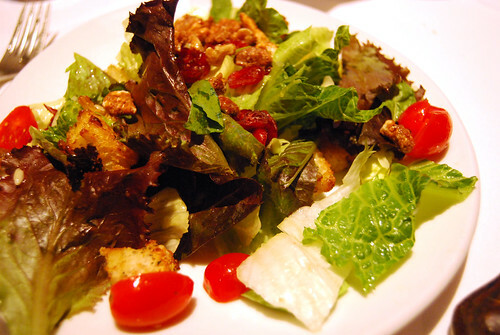 With its lemon vinaigrette, mixed greens, cranberries, candied walnuts and cherry tomatoes, each bite opened up the palette. As for the main course — and the headliner — the prime rib is cooked to your preference. I’m a medium-rare gal all the way and Fleming’s gets it right. It’s a warm pink in the middle. I’ve made prime rib at home countless times for special occasions and one thing that Fleming’s perfects is meaty tenderness. The prime rib is buttery smooth and the 12 oz. is more than enough the feed one very hungry person. 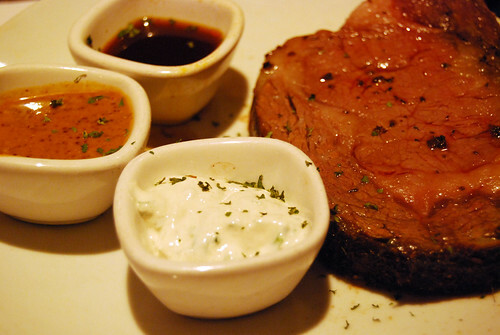 Three sauces are included with the meat: au jus, a mustard Dijon sauce and creamy horseradish. Dip and mix as you please. No one is judging. You get a choice of one side served with the prime rib: Fleming’s potatoes, a baked potato, mashed potatoes, a half order of shoestring fries and onion rings, macaroni and cheese, sautéed or cream corn, sautéed or creamed spinach, grilled asparagus, French green beans or sautéed mushrooms. Torn between the potatoes (which according the menu description is either mashed with blue cheese, parmesan-peppercorn or roasted garlic) and the mushrooms, I went with the latter. 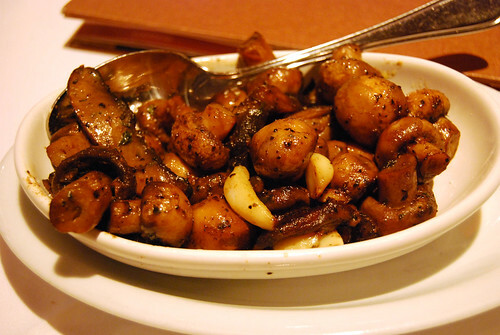 Their mushrooms were neither too oily or greasy (a peeve of mine) and they were lightly seasoned with little gems of whole roasted garlic cloves in the dish. I finished the entire side in a matter of minutes. Just when you think you can’t be stuffed anymore, there’s still the issue of dessert. There’s a total of seven choices: cheesecake, chocolate lava cake, crème brulee, walnut turtle pie, carrot cake, fresh berries with cream and a selection of ice cream and sorbets. I chose the lava cake upon seeing it served to another party next to us. 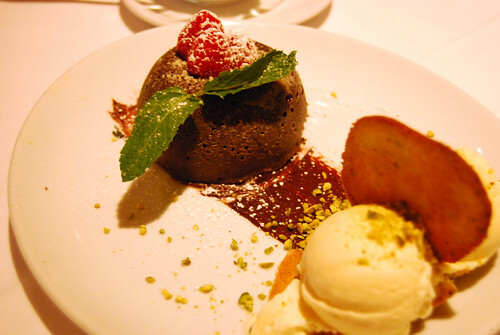 The lava cake is placed off center with two scoops of vanilla ice cream and pistachio cookies. It takes 10 minutes to prep the lava cake, but it’s worth the wait. It’s warm and cold, creamy and crunchy all in one plate. What more could one ask from of dessert except for a no-calorie version? The Sunday Prime Rib Special for $29.99 is available nationwide at all 64 Fleming’s restaurants until September 2. It’s a very popular outing for many people as witnessed on a recent Sunday and reservations are highly recommended. The meal was provided complimentary of Fleming’s Prime Steakhouse & Wine Bar. Opinions are entirely my own. Mmm… Fleming’s Prime Rib dinner is one of my favorite treats. And their prime rib is really tasty. I’m usually waddling back to the car after dinner there! Nothing like being stuffed for Sunday dinner. It makes the transition to Monday so much easier. 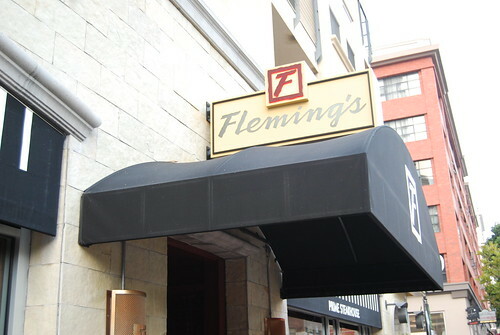 Fleming’s is known for their outstanding cuts of meat so knowing they have a special on prime rib on Sundays is great! I think I may be able to eat the whole thing myself. You are a very talented man, Jeff. I could barely finish half if it myself.